Heat oven to 350°F. Lightly grease 12-cup fluted tube cake pan with shortening or cooking spray. In large resealable food-storage plastic bag, mix granulated sugar and cinnamon. Separate dough into 16 biscuits; cut each into quarters. Shake biscuit pieces in bag to coat, and arrange biscuit pieces in pan. Discard any remaining sugar mixture. Bake 40 to 45 minutes or until dark golden brown and no longer doughy in center. Cool in pan 10 minutes; run metal spatula around edge of pan, and turn upside down onto serving plate. Serve warm. If desired, layer in 1/2 cup raisins or walnuts among your biscuit pieces before baking. 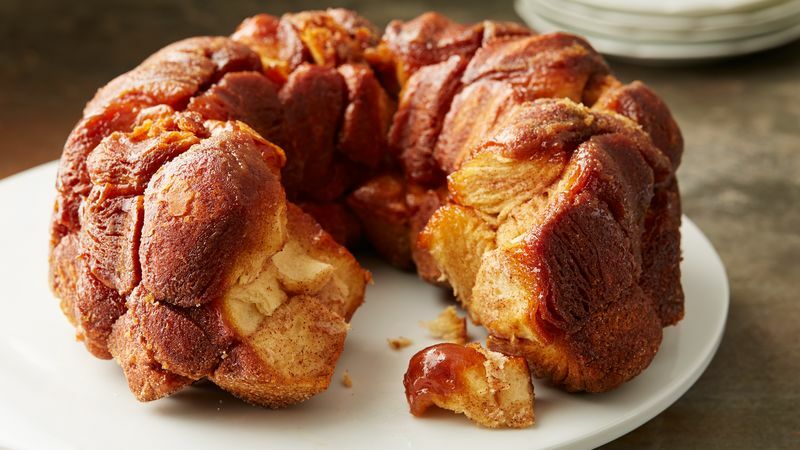 Monkey bread is best served by pulling pieces apart.